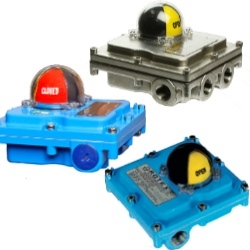 Rotex Limit Switches are designed to last and meet your required service conditions. Both the weather proof and explosion proof switches feature an aluminum die cast enclosure that is powder coated for superior corrosion resistance resulting in a weather proof enclosure to IP67. Stainless steel enclosures are available, also confirming to IP67. Internally, color coded cams are easy to identify and easy to set, and the serrated cams lock together to ensure secure adjustment settings against any vibration. Mountings comply to the NAMUR standard with bracket available as an option. These switches can be certified CU, UL, CE, ATEX, CMRI, or CMRI CCOE, and can be ordered as weather proof, explosion proof or intrinsically safe.